Artist TheArthur Wright's fame stretches from coast to coast partly because of a technique he came across by chance. Standing on the deck of Oakland's Artship on the Pacific Coast, skipper Slobodan Dan Paich said recently during an interview, "You should be interviewing TheArthur. He invented a new art technique." And from the Bronx's PS 145, not far from the Atlantic Ocean, came this tribute from sixth-grader Deeona Deoki: "Mr. Wight's (sic) artwork are superb, splendid, emotional, elegant and pleasant." Wright smiled as he held the letters from the Bronx and talked about the day earlier this month that he showed the students some of his handiwork: tigers and dancers and historical African-American figures. "They were pretty much impressed with my acumen,'' Wright said in mock admiration as we walked around his live/work bedroom/studio near 23rd Avenue/29th Street in Oakland. Trucks and trucks and trucks roared by his rear window overlooking East Seventh Street and Interstate 880. This is not a pretty part of Oakland, where a mad jumble of roads brings a constant din to the neighborhood of old houses and run-down industry. Wright's place is an island of calm. The 39-unit converted plant of Exchange Linen Service is now home to a dozen of Oakland's estimated artist population of about 5,000. Wright, 60, a retired electrician, has been painting on and off most of his life working in acrylic, charcoal and watercolor. And now household bleach. This is what brought him special recognition. As we walked across his studio, we passed by a large black-and-white charcoal drawing of Hannibal crossing the Alps on an elephant, a colorful acrylic self-portrait of the artist with flaming hair and a motion-filled watercolor Zulu warrior before we arrived at a series of tigers painted with this accidental technique. Wright was attempting to fix a painting on black paper when he made his discovery. He was trying to erase some strokes, bleach them out, when he discovered that bleach on black paper left a gold-colored residue. His exact method is a trade secret, he said with a laugh. 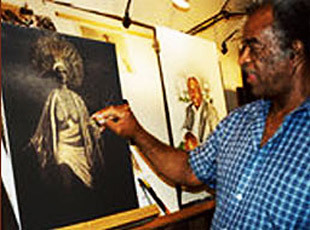 Using this technique, Wright creates tigers and historic characters from African-American history that jump off the black backgrounds like bits of controlled electricity. And that's not surprising because Wright spent 31 years as an electrician and, by his estimate, wired half the new buildings in downtown Oakland. The artist was born in Arkansas into a family with an African-American, American Indian and white background. When he was 3, the family moved to Seattle, where he grew up. He served with the Air Force in Japan and eventually moved to Oakland, where he became an electrician. But deep inside he wanted to be a writer and an artist. He wrote and sketched in his free time and would spend long hours at night working to polish his skills. It wasn't until he was laid off for a short time in 1994 that he redirected his life into painting. When he retired in 1999, it became his avocation. Wright draws to celebrate African life and to pay homage to his African-American heroes. His work and copies of it sell for $50 to $1,000. "I make money but I'd never make a living at it," he said. But he could, I think, because Deeona is right, his works are superb, splendid, emotional, elegant and pleasant.